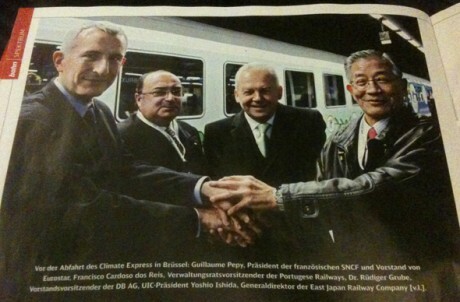 In the January edition of ‘Mobil’, the magazine of Deutsche Bahn there’s a picture of Guillaume Pépy (head of SNCF), Rüdiger Grübe (chair of the board of Deutsche Bahn) and Yoshio Ishida (president of UIC) beaming at Gare du Midi, Bruxelles, in front of the Climate Express, a special day long train organised in December to transport climate conscious politicians to the UN climate summit in Copenhagen. The train was even organised by Deutsche Bahn Charter and wow, what a wonderful bit of publicity for the railways! Look at how green everyone can be by taking the train! No, the real shame is that this special is about the only genuinely long distance service to leave from Brussels. Try getting to Copenhagen on a regular service and it needs a change in Köln and in Hamburg, and a boat from Puttgarden to Rødby. Longer journeys are better overnight, but apart from an irregular ski train for a few months a year there are no night trains from Belgium at all – nothing since the very same Deutsche Bahn stopped running the Paris – Berlin / Hamburg train through Belgium in December 2008. The reason then was a dispute between DB and the Belgian SNCB about rates for access to the Belgian network, a dispute that does not look like it has been resolved. Try the daytime trains and it’s a little better, at least just into Germany. Here there are at least some services – 8 Thalys services a day from Paris Nord to Köln via Bruxelles Midi, and 3 ICE services from Bruxelles Midi to Frankfurt/Main Hbf via Köln. Apart from 30km or so between Aachen and Düren the high speed line between Bruxelles and Köln is now more or less complete. So it’s all fine? Of course not. The Thalys PBKA railsets, essentially TGVs designed by Alstom, are allowed to operate at 300km/h in Belgium, but only 200km/h in Germany, and have no clearance at all for the Köln-Frankfurt HSL. For the Siemens made ICE3s it’s the inverse – max 250km/h in Belgium (SNCB cites the danger of flying ballast and downforce), 250km/h on Köln-Aachen and 300km/h on Köln-Frankfurt. Seriously, what the hell is all of that about? OK, when things work the service is reasonable, but how much government money has been invested in those lines which no train can used to maximum speed along its whole length? Then try it when things go wrong – as they have quite a lot recently – and things get even more laughable. I turned up at Gare du Midi to take the 0725 ICE to Köln on Saturday 16th January. I get to the station and I’m told the train is cancelled. No ICEs to Belgium at all for the first two weeks of January due to bad weather the guy informs me at the ticket office, although by 16th January most snow had gone in Belgium. “Deutsche Bahn doesn’t have enough trainsets at the moment, so they are keeping the ICEs in Germany” he told me – not sure if this is the true reason but it’s illustrative that a SNCB employee even says it. If this is true, is it profit driven – DB makes more cash from domestic services – or it’s that they are more fearful of reputation damage of FAZ or Süddeutsche has a go at them than if Le Soir does? Interesting and annoying in any case. Anyway, what else can I do I ask the guy? “Well you should have checked your train was running before you left home” he says, typical Belgian approach to customer service. Hold on, I booked via the net, DB has my e-mail address, has known for 10 days my train will not run… yet no communication. Eurostar revisited. So then what? You’re lucky the guy tells me, there’s a Thalys in half an hour, and this time you will be allowed to board it. This time I’ll be allowed to board it? Yes, there are some free seats he tells me, normally you would have to take an IC to Liège, a regional train to Aachen, and then a regional train to Köln. What a prospect! Yet Thalys and DB are both members of Railteam, a get-together of 6 high speed rail companies that are supposed to together promote high speed rail. DB cannot get its act together to organise a replacement train, even from Aachen (powered at 3kv DC, so open to Belgian locomotives – why not redirect a 200km/h Eupen bound IC train with Class 13 locomotive to Aachen..? ), and Thalys is refusing to take DB passengers as a matter of course. Seriously, what is the point of Railteam then? Strikes me it’s more like Railmutiny. Compare that with DB’s approach to replacement trains in Germany – 200km/h ICs replace ICEs – and it all looks highly negligent. To cap it all there was a major signalling problem at Aachen on the day I travelled, so the Thalys only managed to get to Welkenraedt and from there someone (DB? SNCB? Thalys?) managed to hire a couple of city buses to take us on towards Köln. Of course it took 30 minutes before the buses left, we were all on foot for 80km or so in a city bus on the German autobahn, and the promised destination – Köln – was not Köln, but Horrem, a suburb with a S-Bahn station. Yet again this is Eurostar revisited – if there is a problem, what are the procedures? No-one seemed to know, and for sure no-one wanted to inform the passengers what was going on or take responsibility for anything. They had even told us to get off the Thalys at Liège, only to then tell us to get back on again and go as far as Welkenraedt. I suspect there’s even more to this whole saga than the rudimentary stuff I can determine here through persistence and logical thinking, and somehow it strikes me that the whole liberalisation of European railways into the next decade is going to inevitably just lead to a big scrap between SNCF and DB, just as airline liberalisation has forced consolidation of the airlines. Is not as if passengers were served especially well by the old monopolies when it came to international travel but we have some way to go until a new, and hopefully better, equilibrium is established. Stockholm-Malmö by night train booked at http://www.sj.se. Malmö-Copenhagen bought in the ticket machine at the station. Should be possible to include as part of the night train booking, but when I tried, the booking system found that it’s faster to go to Copenhagen if I only stay on the night train for three hours and use lots of different connecting day trains instead. How am I supposed to sleep that way? The ticket machine at the station is a little bit cheaper than buying the ticket on the Internet if you have to split up the booking, assuming that you have the right discount card. If you manage to get both legs as part of the same booking, then you still get the higher price for the Malmö-Copenhagen leg, but at the same time, Stockholm-Malmö becomes part of an international trip, so you no longer need to pay 6% VAT for that ticket, meaning that the total sum becomes about the same as a split up booking. Copenhagen-Århus by day train booked at http://www.dsb.dk. If I book an Europa-Spezial from Stockholm to Cologne, CIV takes me to Cologne even if the connection breaks in Copenhagen. However, if I have to take a different train from Copenhagen to Cologne, then the connection is also going to break in Cologne. Will the ‘hop on the next available train’ rule let me continue on my trip to Paris (or London or wherever), or will I have to get a new ticket since the connection already broke in Copenhagen? Conversely, when going back, what happens if the connection breaks in Cologne so that I also miss my return train from Copenhagen? Will I be able to get on a different train in Copenhagen in that case? In terms of information on rail journeys I have found SBB do a superb job. Unfortunately, it’s not always possible to book those journeys through their site. I had real problems when I tried to book via TGV, etc from our home station (in SW France) to Berlin: SBB couldn’t do it, the SNCF site couldn’t manage it, and even a SNCF station booking clerk at first denied it was possible. I also have found seat61.com (the man in seat 61) to be informative when helping myself and others to plan long distance journeys in and beyond Europe. SNCF and DB have a lot to learn, never mind Railteam. Jon, given how overworked German locomotive drivers are (see this report on ZDF: http://frontal21.zdf.de/ZDFde/inhalt/26/0,1872,8014106,00.html), it’s probably good if you don’t take their trains for the time being. Deutsche Bahn is currently going from one scandal to the next, mostly due to profit-driven decisions that affect passenger comfort and/or safety – not to speak of their own staff. Too right, Railteam has achieved nothing; although I suspect that’s mostly because the individual companies within it (led by DB and SNCF) do not want Railteam to supplant their own identities in the slightest, so haven’t made any efforts to make it useful. If you look at their site, their only commitment (‘hop on the next train’) is to assist with alternative connections between railteam services if one is delayed to the extent that you miss a connection to another railteam service. As for a single booking system, they quietly dropped that last year on grounds of cost and complexity, although it was one of their initial promises. Such a system is on the Commission’s radar, and would presumably cover all international services not just high-speed ones. But it’s not clear to what extent they can act in this field, since they’re not likely to set it up themselves. Airline CRSs already existed, and the Commission acted to ensure each one treated all services fairly, not favouring those of its owner airlines. Here there is very little by way of competition between services, so little by way of a competiton issue in respect of booking systems. So it may require a lot of carrots. Of course it’s worth remembering that computerisation has made the rail ticket system much worse for international journeys. Not so long ago, one could purchase a rail ticket, and seat reservations, for pretty much any journey in western Europe from many stations or travel agents. Now, where that is still possible, one can generally only get the more expensive fares, with the cheap ones restricted to the system of the company concerned. And more often than not, it’s not possible. you should definitely apply ;). Secondly, two journalists published a “black book” on Deutsche Bahn on Monday, claiming among others that the company employed cheap workers from Eastern Europe who were forced to work eleven hours a day, seven days a week for months. In some cases, they apparently only paid the workers 1,50 EUR per hour for their work. More info is here: http://bit.ly/4uZj93 (also in German). Yes, Railteam is a sham as far as I can tell. Proper coordinated timetables and a unified booking system would have been really helpful, but those are not going to happen. The fact that it doesn’t work when things go wrong makes it even more pointless. On the FR-IT thing – the same has happened for the use of the LGV Est line towards Strasbourg and then on into Germany. SNCF and DB split things on those routes – SNCF runs the Stuttgart and München high speed services, while DB runs the ones to Frankfurt. Same looks like it might happen for Eurostar where DB might take a share in Eurostar rather than running competing services. Quite frankly I don’t know what SNCF is worrying about so much. They have plenty of know how – why don’t they expand internationally, run in other markets, while accepting that nationally they are not going to be able to maintain 100% share? Jon, is Railteam” just someone’s marketing idea? They were going to have a “one-stop” website for timetables, fares and bookings throughout Europe: but that seems to have disappeared even before it appeared? I actually prefer taking the train to driving or to flying. But, as you note, the rail companies (and/or their governmental masters) do their best to make it as difficult as possible. SNCF, here in France, are said to be “really worried” about DB gaining competitive access to certain lines in France. But they’ve ensured that the competition from Italy will be nil – by entering into a “partnership” deal. Exactly what the EU hoped wouldn’t happen, Ho-ho.